From the natural wonders of Niagara Falls to the cities of Toronto, Ottawa, Montreal and Quebec City, this journey showcases the heartland of French and English Canada – and you do it all in comfort and style, on a train. Don’t Just SEE the Power of Nature – FEEL It! Niagara Falls. Words can’t describe the power of Nature when it is concentrated like this – you have to feel it for yourself. And we get you up close! We also get you away from the crowds, where we prefer to stay - in the nearby wine-growing region and Niagara-On-The-Lake. Toronto and Montreal are big, cosmopolitan cities – one the heart of English-speaking commerce in Canada, the other the heart of French-speaking business. Ottawa, the national capital, has wonderful museums, and Québec City is quaint and the place to learn about the history of the French in Canada. Arrive in Canada's largest city, Toronto, and be whisked away to the charming town of Niagara-on-the-Lake. Surrounding you are rolling vineyards and blooming flowers, framing Lake Ontario. Enjoy the convenience of a private transfer from the Toronto Airport to your hotel in Niagara. We've included dinner tonight at one of our favourite restaurants in Niagara-on-the-Lake. Overnight at The Prince of Wales Hotel. This property is located in the heart of historic Niagara-on-the-Lake, and is a treasured landmark hotel of Victorian elegance. During your stay enjoy the on-site dining options, spa, fitness centre, lounge, indoor pool and hot tub. Each room is a unique and intimate hideaway with luxury furnishings for you to enjoy your stay in comfort. Whether you decide to witness the splendor of the Niagara Gorge, or the rolling woodlands of wine country, you will end your day full of wonder and discovery. Travel through the lush Niagara Peninsula on a delightful tour of the Niagara Wine Region. Enjoy stops at wineries for tastings and tours before you dine on a delectable lunch at a charming eatery along the parkway. The tour allows free time to explore the captivating 19th-century town of Niagara-on-the-Lake. Today you will enjoy a comprehensive guided tour of the Niagara Region. You'll visit the upper rapids, the falls up close, and so much more! Afterwards, you’ll enjoy a buffet lunch before you continue onto the historic quaint town of Niagara-on-the-Lake to explore. As you travel back to the ‘big city’ this morning, the funky and colorful neighborhoods of Toronto are waiting to be explored. Spend the day at your leisure and discover what lies behind Toronto’s famous skyline. Enjoy the convenience of a private transfer from your hotel in Niagara to your Toronto hotel. Take in the magnificent views of Toronto from one of the best vantage points in the city, the 360 Restaurant located high above in the CN Tower. Overnight at the Fairmont Royal York Hotel. Standing in the heart of downtown Toronto, the Fairmont Royal York is conveniently situated directly across from Union Station. This landmark hotel is within walking distance of Nathan Phillips Square, St. Lawrence Market, Toronto Eaton Centre, and Yonge-Dundas Square. Enjoy the spa and health club, where guests can take advantage of the indoor pool, relax in a steam bath, or enjoy a luxurious massage treatment. Additionally, you will find multiple dining options to suit every occasion. Settle into your seat for a relaxing train journey in the company of fellow travelers. Travel along the shores of Lake Ontario passing small farms and villages before you reach our nations capital - Ottawa. Travel by train from bustling Toronto to Canada's capital city. Settle into your seat for a relaxing train journey as you travel past dense forests, over rivers, and through towns and farmland. You will be seated in a spacious business class seat. Enjoy exclusive access to the in-station business class lounge before your trip. Food and cocktail service is included. You will be met by your own private driver and vehicle to make your way in comfort from the Ottawa train station to your downtown hotel. Ottawa is a beautiful Canadian city, with countless attractions and hidden gems. This is the federal capital of Canada so museums abound - the Museum of Civilization, the Canadian War Museum and the National Art Gallery, all awaiting your visit. Join a local guide for a leisurely bike ride along the Rideau Canal pathway, continuing to the Locks, a wildlife garden and arboretum, and ending with a short visit to the Parliament area. You will get a great view of Ottawa's downtown core and beyond on this tour, staying 95% on designated safe bike paths. As the train rocks and sways out of Ottawa, you journey towards the open farmland of eastern Quebec, chat with old friends and new, dip into a book, or do the crossword. This is what train travel in Canada and being on vacation is all about! Rich in culture and beautiful architecture, Montreal makes for a fabulous city to explore. Venture by foot along the cobblestone streets and narrow lane-ways discovering what makes this city fabulous. Immerse yourself as you take an insider’s look at Montreal’s fascinating history, architecture and vibrant culture on this small-group tour today that provides a true local perspective. Cycle the Downtown and Vieux-Montreal neighbourhoods of Montreal on a sightseeing tour. Your local guide will share history, stories, and anecdotes while stopping at the must-see sights. Voyage by train along the St. Lawrence River to Quebec City, where your surroundings fill-up with old stone buildings, cobbled streets, distant mountains, and a wealth of history and culture. Take the day to explore the rich history of this wonderful French city. 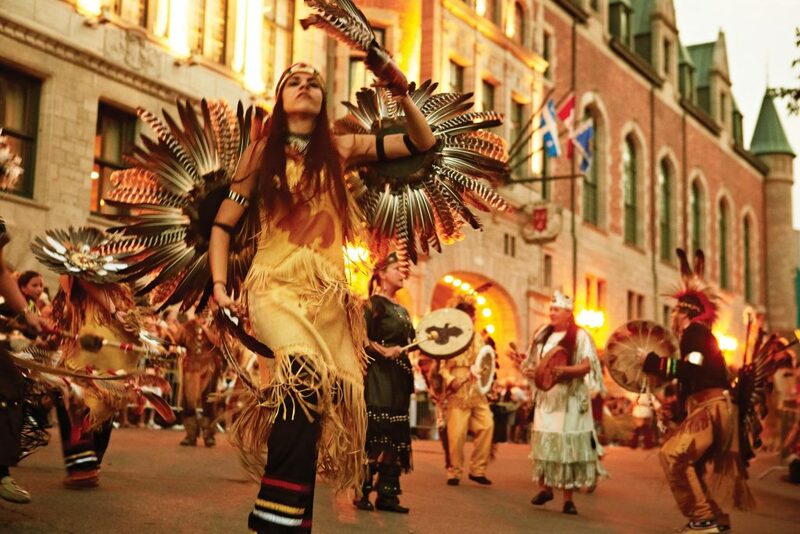 Get an overview of Quebec City's history on a guided sightseeing tour. Visit places like the Plains of Abraham, the world famous Château Frontenac, Basilica, City Hall, Place-Royale, Citadelle and more. Say farewell to Canada's scenery, history and culture as you are transferred to Quebec City’s airport, in time for your flight home. Overnight at The Queen’s Landing Hotel. This historic property is located at the meeting point of the Niagara River and Lake Ontario, an ideal spot for exploring Niagara-on-the-Lake. The hotel boasts opulent, well appointed rooms and and an outdoor patio with river views. Enjoy amenities such as the on-site spa, on-site dining options, lounge, extensive library and indoor pool. Overnight at the Auberge Saint-Antoine. This hotel blends three centuries of history with 21st century luxury. Located in the heart of Québec City’s Old Port, the Auberge is just steps from the fortifications, museums, and bustling streets of the Petit Champlain district. Enjoy exploring the archaeological artifacts on display right in the hotel, or indulge in fine dining at an award-winning restaurant. Comfort level hotel prices include Economy class on VIA Rail. Train schedules are subject to change and delays may occur. Ottawa bicycle tour is available between April 27 and September 26, 2019 departure dates. Small Group tour in Montreal is available from the May 23 to October 19, 2019 on Tuesdays and Thursdays. Montreal Highlights by Bike tour is available between March 26 to October 25, 2019 departure dates. This trip is available for departures between April and December. based on double occupancy, December 2018 departure and our base class.